Class of '57 Had its Dreams. McLeod High School Longhorns. Class of '57 Had Its Dreams. The Texas Longhorn was our school mascot from the beginning. Please see www.greatschools.net …The graduating class of 1957 at McLeod High School had 21 graduates. Of those 21, take a guess who was the tallest in the class. Me, yours truly. And my soon to be wife, high school sweetheart, Bobbie Jean Weemes, was the shortest. (You know what they say: opposites attract.) Since she was the shortest, she was first to proceed down the auditorium isle and receive her diploma. And me being the tallest was last to walk down the isle. That moment in our lives was one of the greatest events and achievements for us, ever. "Just get that high school diploma, son!" And thankfully our parents would settle for NO less. As I write this memoir, my recollection brings back two very important lessons that my parents passed along to me as a youth. Mom always said, "Son eat your vegetables." And Pop always said, "Save your money and watch your friends." Both of which are still to this day very good advises. Five servings of vegetables a day can promote good health and saving your money can promote wealth; all the while watching any good results your successful friends can obtain. I still pass these things along to my children today. "Oh, The Class of '57 Had it's Dreams", according to the popular old Statler Brothers hit song. And we really did. Just take a look, as I reminisce and review my 1957 yearbook. Here is the totality of my graduating classmates. Most of whom I still remember pretty well to this day. We still hold a class reunion about every three to five years and have a good time together. There are some though that, for whatever reason, never get attend our celebrations. They said that I was very near a star athlete in high school. That I had good height; good athletic skills and very good coaching from Coaches Fite, Wilkerson and George. I lettered in basketball all four years while playing on the "varsity" team. Back then we didn't call it varsity. It was the "A" team and of all the sports I played, I enjoyed high school basketball most. Most always, I played the "center" position on both offense and defense. During good games, I would score 18 to 24 points and really had fun doing it. My senior year, we played a tournament at Waskom and brought home all the trophies. During the time I was in eighth grade, our coach was watching me closely. He saw me working really hard in the gym, practicing and dedicating lots of time to it. I was practicing my favorite shots; the fade away jump shot; the hook shot, free throws and lay ups. Coach Fite often used some of us eighth grade underlings during practice, as red shirts to scrimmage against the first string high school players. I just wanted to play basketball. One day while I was still in the eighth grade, coach told me, "Maxie, if you keep up the good work, I'll let you play on the high school "B" team, soon." And, they said, contrary to High School Interscholastic League Rules, he did just that. I played in a lot of high school "B" team games while I was still an eighth grader. And they say coach never got into trouble with the league officials. But, they say he did have some very serious conflict with a few of the fathers of other players that I was replacing on the high school "B" team. Back in 1957, McLeod was ranked a "15B" school. Or maybe "2B". That was the last year that McLeod High had a football team. Since it was such a small school, many times players, such as other teammates and myself were found playing on both the offensive and defensive squad. My senior year I was awarded the all district player award twice that year. I won offensive all district right tackle, plus defensive all district right guard. I had lettered all four years and received football jackets each year. Other players did the same. I was proud of those jackets and kept them for many years. I never pursued organized athletic sports after high school. I later attended East Texas State Teacher's College (now East Texas State University) and The University of Houston to obtain a degree. My teenage bride and I raised two sons and are now happily retired after many years of employment as "public servants". 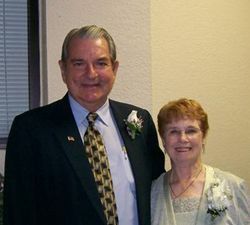 Recently we celebrated our 47th wedding anniversary. We find a lot of pleasure in helping others by volunteering for various civic organizations; public speaking, writing, donating, traveling the USA a lot and helping our family and friends. We also have a few of our favorite animals to attend here on our "city" estate we call "PIDDLIN' ACRES". All this is just part of my "Deep East Texas Roots" in Cass County. I am happy to have grown up during the fifties near McLeod in the oil patch. I am proud to be an American. I am proud to be a McLeod Longhorn. If you ever care to, you may email us at piddlinacres@consolidated.net ….